Picture HY1 (Unknown Originator). Probably early-mid 1960s, looking south out of the secured area past the RAF Police security picket (image right) and sliding electric gates. The administration areas lie beyond the gate and in the far distance are the standby generators and probable vehicle garage. I am assuming that this photo was taken from a centralised watch position on the maintenance building. Photography was prohibited on the site which either means this picture was taken against that ruling or that it was taken once the site was decommissioned. The latter is more likely as all 3 security gates are open, which would be highly unlikely if the site was in use. 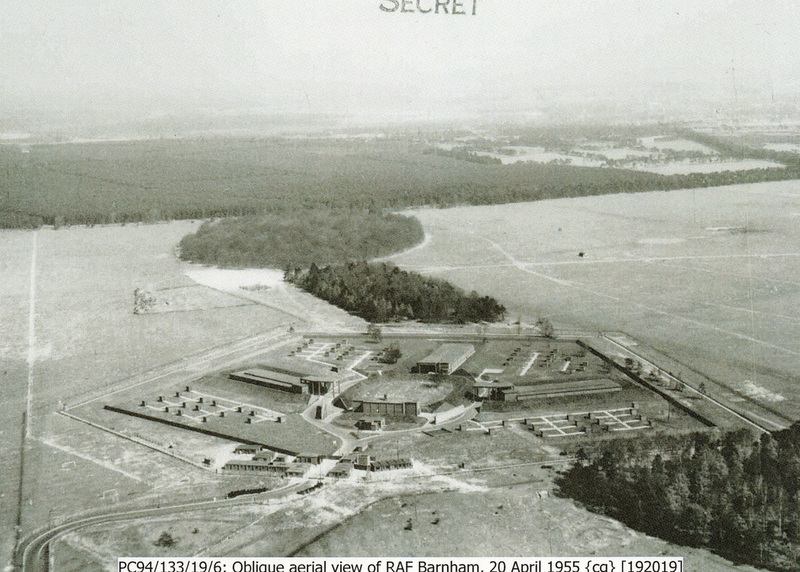 RAF Barnham is a Royal Air Force Station in Suffolk, some 2 miles south of Thetford and northwest of Barnham Village, positioned on Thetford Heath. The original Barnham Camp had links to chemical warfare storage during the Second World War and was originally constructed as a bomb dump. The "bottom site" is still operational as a satellite unit to RAF Honington, utilised as a training camp. During the mid 1950s a specialist storage area was constructed at Barnham to house Britain's first production nuclear free fall bomb, BLUE DANUBE. The National Archives have the RAF documents that describe the 'Specialist Storage Site' as forming in June 1954 as part of No. 94 Maintenance Sub Unit at RAF Barnham. Its main purpose, along with its sister site at RAF Faldingworth, was to serve the soon to be formed V-bomber Squadrons. Barnham was responsible for supporting No 3 Group, Bomber Command and included RAF Wittering, Marham, Cottesmore and Honington, with RAF Faldingworth taking care of the 'northern' bomber airfields. The storage bases would serve as maintenance depots for the weapons as well as holding a stockpile that were to be used in a 'second-strike' scenario. Picture HY1a © Crown Copyright via AWE, from Wikipedia. Vickers Valiant dropping a BLUE DANUBE casing. Picture HY2 © Crown Copyright. Barnham, over a decade before it became operational. The eastern part of 'Top Site' was positioned in the centre of the clump of trees on the image left. 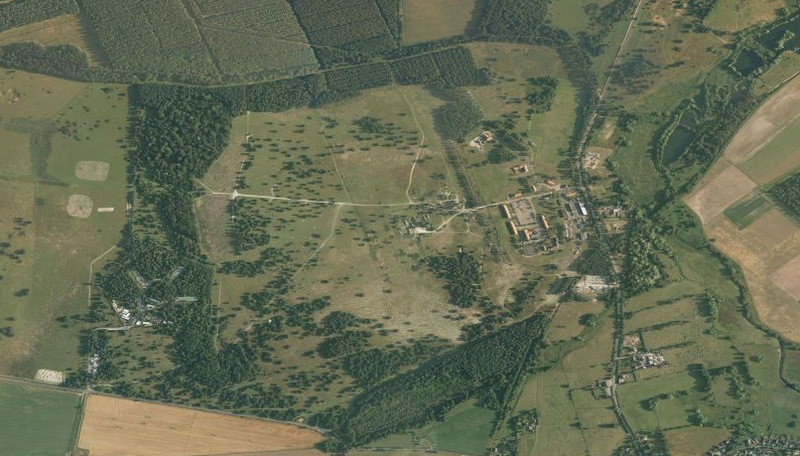 The ammunition storage areas of the old Barnham Camp can be seen image centre. Picture HY2a © Microsoft Corporation © Getmapping PLC. 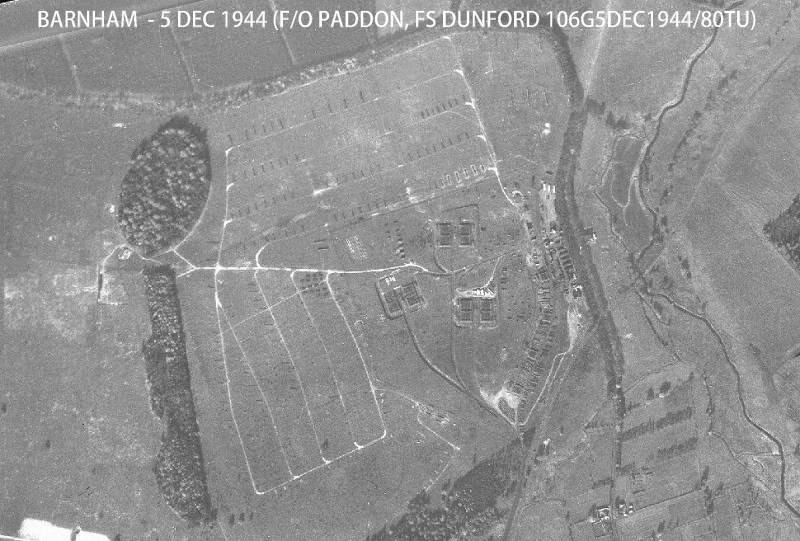 A more recent view from a similar perspective showing 'Top Site' image left and the current RAF Barnham image right. This latter area was the domestic site for 'Top Site'. Picture HY2b. Image is courtesy of the RAF Museum, Hendon, Department of Research and Information Services, catalogue number 192019. A 1955 image of Barnham from the South Aspect, probably pre-initial operating capability. grouping. Hearsay reported the cost of the build at £1.5 million pounds in the 1950s, probably around £30 million in today's money. The site became redundant when BLUE DANUBE and its smaller successor, RED BEARD, were retired from RAF service due to the advances in other nuclear weaponry. These newer weapons did not require a large storage and servicing depot such as Barnham. 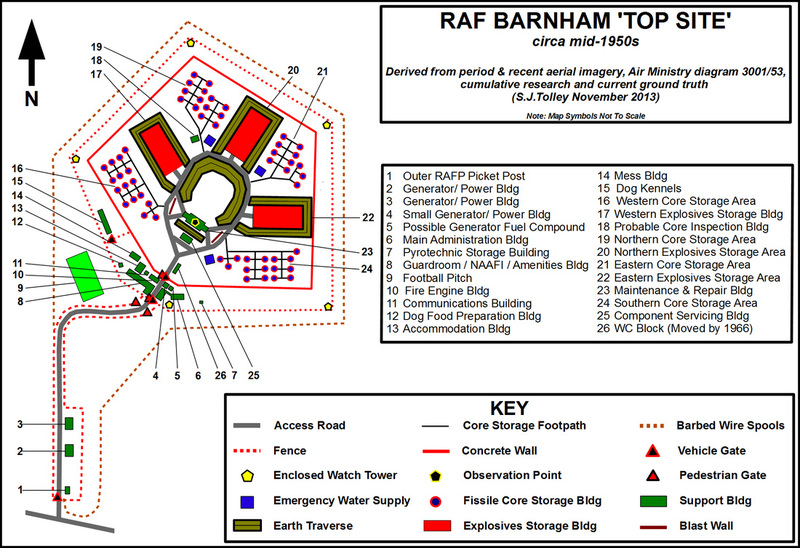 Changes in doctrine also played their part in Barnham's demise, with the hand over of the strategic nuclear deterrent to the Royal Navy in 1968 and the decision to store the tactical nuclear weapon, WE177, at the operating airfield's specialist storage areas with no required 'middle-man' unit. The National Archive's reveal that Barnham's 'A' security grading was removed in July 1963 and in the same month the overhead flight bans were lifted and its buildings cleared. Its sister site at RAF Faldingworth remained operational for longer, after it began to store the YELLOW SUN H-bomb. In 1966, the site was purchased from the RAF for £20,000 by the current owner, Mr Keith Eldred, for the purpose of growing mushrooms within the large explosive storage buildings. These buildings were once used to store the very large BLUE DANUBE bomb minus its fissile core; the latter were stored in individual fissile storage buildings known to those on site as igloos. Following this venture, Mr Eldred made use of the buildings as light industrial units and the site became the Gorse Industrial Estate, still in use today under Mr Eldred's ownership. Due to Mr Eldred's resourceful utility of the site and passion for its history, it has remained mostly intact. There are only a handful of small support buildings and site features that didn't survive. The biggest losses were one of the large explosives storage buildings which was destroyed by a fire in the 1980s and a necessary demolition of the SECO guardroom in the 2000s. Mr Eldred is working with English Heritage to preserve the site. Such is the significance of this facility to the history of the UK and the Cold War that it is now a scheduled ancient monument with three grade II* and two grade II listed buildings on site. The University of East Anglia are also interested in this area and its preservation, it is a great example of a site that supports elements of their "COLD WAR ANGLIA" project.